Online sales show no sign of slowing and the growth is driving demand for fulfilment operations to pack and ship all those ordered goods. The work is repetitive, however, and requires high accuracy to reduce costly errors or returns. That means that jobs in picking and packaging items for shipping aren’t particularly desirable, especially in tight labour markets. These tasks are ideal for automation, but there are challenges. While repetitive, packaging applications are also highly variable, requiring the ability to recognize and pick a wide range of items, in different sizes, weights, and materials. 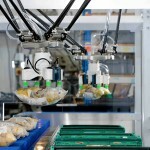 And human workers are typically still needed for upstream and downstream processes that are often performed right next to the packaging operation. 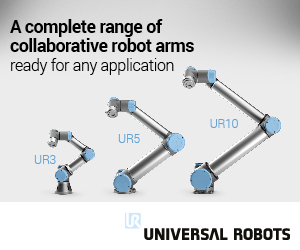 With that combination, collaborative robots fit the bill perfectly. 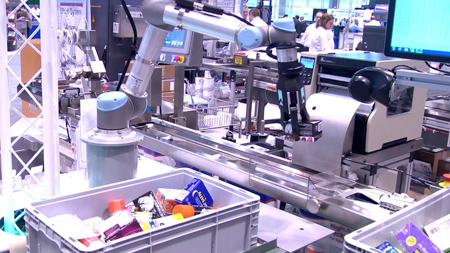 Cobots offer low upfront costs, flexible implementation, and easy programming for developers who are rapidly creating innovative new systems to optimize bin-picking and packaging. And with no need for safety guarding (after risk assessment), they are ideal for collaborative operations next to human workers. It’s not reasonable for a warehouse to have 3D models of all the items in the warehouse. 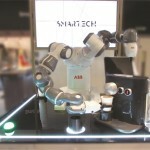 The real challenge is to enable robots to pick things that it’s never seen before, just as a person can. 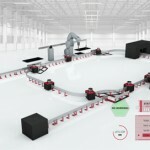 The RightHand Robotics technology has also been incorporated into multiple other logistics systems, such as the Autofulfillment SPrint System from Accutech Packaging in Foxboro, Massachusetts. The system automates the outbound bagging, labeling, sorting, and shipping of merchandise such as health and beauty aids, electronics and office products. That’s an 8x to nearly 10x improvement in productivity, which is critical to meet consumer demands for fast product fulfilment. 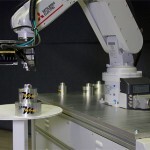 The RightHand Robotics system combines a fingered gripper with a suction cup along with a UR robot arm to provide a system that is reliable and fast to meet the 600 packages-per-hour goal. 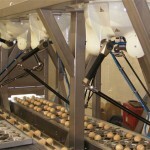 Eurosort – based in Amsterdam and with North American operations in Baltimore, Maryland – is also using the RightHand Robotics system with its Bomb-Bay sorter (also known as a flatsorter or split-tray sorter). The system is used for high-throughput applications for lightweight items under 25 pounds, such as apparel, books, pharmaceuticals, polybags, and more. It can sort from 7,000 items to 30,000 items an hour. Scott Eisenberg, key account manager for Eurosort, is very familiar with the challenge of filling material-handling jobs, and how collaborative automation can help. “In the whole material-handling industry, there’s a labour problem – either a labour shortage or quality of labour – and having robotic induction helps with that,” he says. That’s especially true when warehouses are located far from areas where workers live, and during peak seasons when it can be difficult to find and train workers. 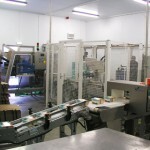 The Rightpick system, inducting onto the EuroSort Split-Tray sorter, is designed to work alongside people. 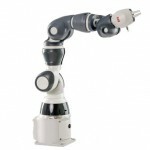 That makes the collaborative robot arm important. Eisenberg explains, “With a lot of other arms, you have to have a big cage, you have to kind of keep them away from the rest of the inductors. By using the UR arm, we can stand right next to it.” Human workers can be inducting along with the robot, and not have to worry about their safety. 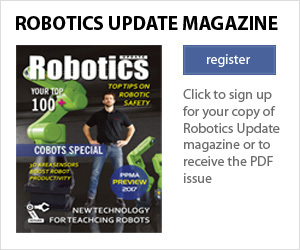 “It’s a really great collaborative effort between robot and person,” he states.